We are bombarded with more information each day than our brains can process—especially in election season. It’s raining bad data, half-truths, and even outright lies. New York Times bestselling author Daniel J. Levitin shows how to recognize misleading announcements, statistics, graphs, and written reports revealing the ways lying weasels can use them. It’s becoming harder to separate the wheat from the digital chaff. How do we distinguish misinformation, pseudo-facts, distortions, and outright lies from reliable information? 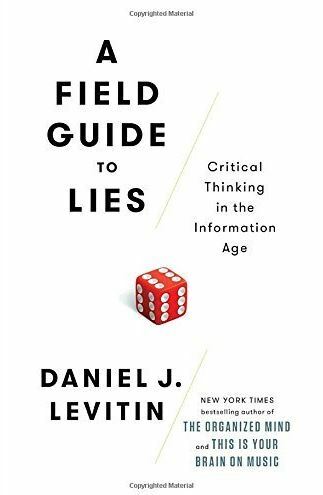 Levitin groups his field guide into two categories—statistical information and faulty arguments—ultimately showing how science is the bedrock of critical thinking. Infoliteracy means understanding that there are hierarchies of source quality and bias that variously distort our information feeds via every media channel, including social media. We may expect newspapers, bloggers, the government, and Wikipedia to be factually and logically correct, but they so often aren’t. We need to think critically about the words and numbers we encounter if we want to be successful at work, at play, and in making the most of our lives. This means checking the plausibility and reasoning—not passively accepting information, repeating it, and making decisions based on it. Readers learn to avoid the extremes of passive gullibility and cynical rejection. Levitin’s charming, entertaining, accessible guide can help anyone wake up to a whole lot of things that aren’t so. And catch some lying weasels in their tracks!